For more than 200 years, Congress has conducted numerous high-level investigations that have riveted the nation, inspired landmark legislation, and transformed American history. These investigations have focused on a wide array of subjects and issues, covering some of the most significant events in our nation's past, including John Brown's raid on Harpers Ferry in 1859, the impeachment of Andrew Johnson in 1868, the Teapot Dome scandal in 1924, the attack on Pearl Harbor in 1941, the Army-McCarthy hearings in 1954, the Watergate scandal in the 1970s, and the attacks on September 11, 2001. These events have been turning points in American history, and they are vital to our understanding of the U.S. government and political system. 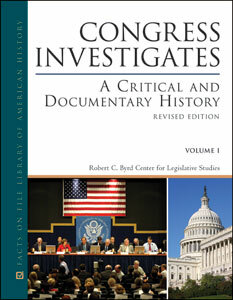 Since the publication of the first edition of Congress Investigates: A Documented History more than 35 years ago, Congress has conducted additional investigations of critical historical importance. In addition to new, in-depth articles on these recent investigations, every original article, written by distinguished historians, has been updated and includes illustrations, detailed chronologies, and brief overviews of each investigation. The authors have also added an introduction to every original document in the set, highlighting its significance and historical importance. Loaded with outstanding articles and special features, Congress Investigates: A Critical and Documentary History, Revised Edition is a definitive, comprehensive, and up-to-date reference on this fascinating subject. Black-and-white illustrations. Original documents. Index. Bibliographies. Chronologies. Overviews. In two volumes. The Robert C. Byrd Center for Legislative Studies is a nonpartisan educational organization administered by the Congressional Education Foundation located at Shepherd University in Shepherdstown, West Virginia. Editor Roger A. Bruns has served as both President of the Association for Documentary Editing and Deputy Executive Director of the National Historical Publications and Records Commission for the National Archives and Records Administration. He has written numerous works of history, including Preacher: Billy Sunday and the Rise of American Evangelism; Almost History: Close Calls, Plan B's, and Twists of Fate in America's Past; The Bandit Kings: From Jesse James to Pretty Boy Floyd; Knights of the Road: A Hobo History; and A More Perfect Union: The Creation of the United States Constitution. Editor David L. Hostetter, Ph.D., is the Director of Programs and Research at the Robert C. Byrd Center for Legislative Studies at Shepherd University. He is the author of Movement Matters: American Antiapartheid Activism and the Rise of Multicultural Politics and several scholarly articles, including "Experiment in Persuasion: The Vigil Against Biological Warfare at Fort Detrick, 1959-1961," "Antiwar Protest in the 1960s," and "'An International Alliance of People of all Nations Against Racism': Nonviolence and Solidarity in the Antiapartheid Activism of the American Committee on Africa, 1952-1965." Editor Raymond W. Smock, Ph.D., is the Director of the Robert C. Byrd Center for Legislative Studies at Shepherd University. He is the former Historian of the U.S. House of Representatives and past president of both the Association for Documentary Editing and the Society for History in the Federal Government. He is currently serving as president of the Association of Centers for the Study of Congress. His recent publications include Masters of the House: Congressional Leadership over Two Centuries and Landmark Documents on the U.S. Congress. Smock also coedited the 14-volume documentary series The Booker T. Washington Papers, served on the editorial board, and contributed to the four-volume Encyclopedia of the United States Congress. "This well-researched and richly detailed resource provides an excellent overview of major congressional investigations and will be a quality addition to a high school, public, or undergraduate academic library." "...a unique resource for students of American history and politics." "...an excellent combination of context and primary materials..."
"This new edition is certain to match the standard set by the original edition...Highly recommended."